On July 23, in order to accelerate the Qing Xiling 5A scenic area to create the pace, greatly enhance the core scenic area comprehensive environment, Qing Xiling protection zone organization held "work energetically for 20 days, environment improvement" special action mobilization meeting. Attended the meeting county leadership Han Zhaohong, Liu Yongsheng, Feng Gongxi, Liu Delu, Huang Wei, the administrative organs, Wenguan Department office, forest management, unhistorical of all the cadres and workers, the Xiling Town, Liang Ge Zhuang town party secretary, mayor, a cleaning company people in charge of a total of 160 people attended the meeting. 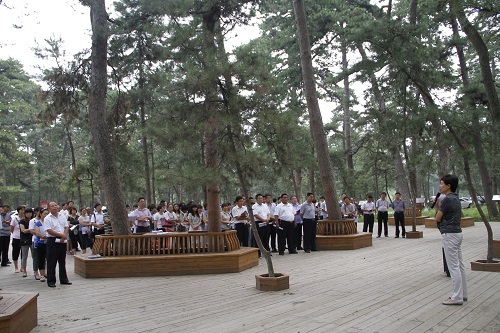 Read out at the meeting and the issuance of the "Baoding Qing Xiling protection zone on carrying out" work energetically for 20 days, environment improvement "special action plan", a clear the action of the guiding ideology, objectives and tasks, implementation steps and safeguards, responsible comrades made a statement said, the county Party committee, deputy secretary, Qing Xiling protection district Party committee deputy secretary, the CMC director Han Zhaohong around special action stresses the important views.